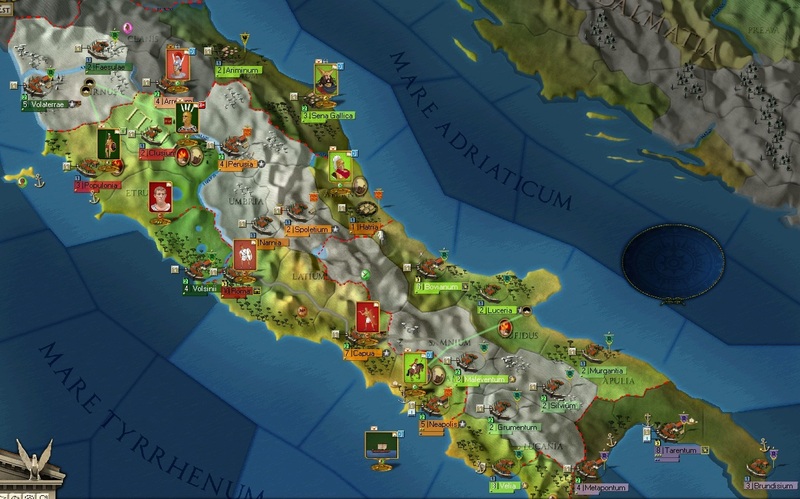 Hello everyone, after playing through all the scenarios as Rome and having a fairly easy time I decided to now play through them as the enemies of Rome. I won't tell you about the less important details like "I placed requisition in..." or "I recruited archers in...". If you want me to be more detailed tell me but I feel that isn't necessary. The first scenario will be the first in the BOR timeline, the Third Samnite War where Rome is fighting against the Samnites and Etruscans at first and the Umbrians and Senones later. Let's take a look at the map, shall we? two Samnite armies but one is very small and I will propably have to include it into the bigger stack for actual combat, the leader of the large Samnite army is very good with a 5-3-3 rating and several good traits! The Senones also have a small army but I would really like to have their Pedites... I don't know what the conditions for unlocking them are so let's just see! The Romans and their allies have 4 legions and can call 2 additional legions with a dictator when I am near Rome, they can recruit Socii legions - as time progresses, they will be able to recruit more - and they have some supporting troops. The legions are the ones I have to watch out for as I have few chances to defeat them in open combat unless I have a huge numerical superiority. The Greeks don't like the Romans but they are not willing to fight either so they will propably be neutral in this scenario. The small Samnite army moves to besiege Luceria which is an objective province. The main Samnite army will besiege Velia to put the Lucanians and their small army out of the war. The Etruscan navy will blockade their port. I hope the Romans will concentrate on the Etruscans first - their army is useless unless attacked as it is locked indefinitely! I am setting the Etruscan army to defend at all cost..
No combat happened, the Romans are besieging the Etruscans town of Volsinii which has no port and won't hold out long. The Lucanian army moved out of Velia but I don't want to assault Velia yet because I am scared the Romans will counter-attack my weakened army after the assault. I am ordering the smaller Samnite army besieging Luceria to assault, I want it merged with the bigger one as soon as possible. The assault on Luceria failed miserably with 2000 losses vs 600 losses, but luckily I had no element losses so let's just pretend it never happened. Onwards with the siege! A small naval encounter between the 10-squadron Roman navy and my 20-squadron Etruscan navy ended obviously victorious for me but the Romans quickly retreated leaving the losses very minor at 307 Romans vs 187 Etruscans. The most important battle of this turn was the Roman attack on the now unlocked Etruscan army. In several smaller battles, both sides lost 1 element. But the losses favour the Etruscans which only lost ~5000 men while the Romans lost more than 7000 men! Since neither side was pushed out of the province, 10000 Romans now stand against 30000 Etruscans! But I am unable to counter-attack because the crappy leader is unactivated this turn. Thanks a lot! In other news, a newly recruited Etruscan archer joined the Etruscan army. Another Etruscan victory! The Romans lost a Hastati element and I gained 1 National Morale. But my leader is still unactivated... I hope they won't reinforce this army or move away before I am able to counterattack! The Samnites are still besieging and a newly recruited Samnite infantry unit joins the smaller army. Now it should be strong enough to hold out against counterattacks of a single legion - and since 3 Roman legions are committed against the Etruscans I should be relatively safe. Yet another Etruscan victory, the Romans lost a Rorarii element and I gained another 1 NM. More good news, the garrison of Luceria surrendered! 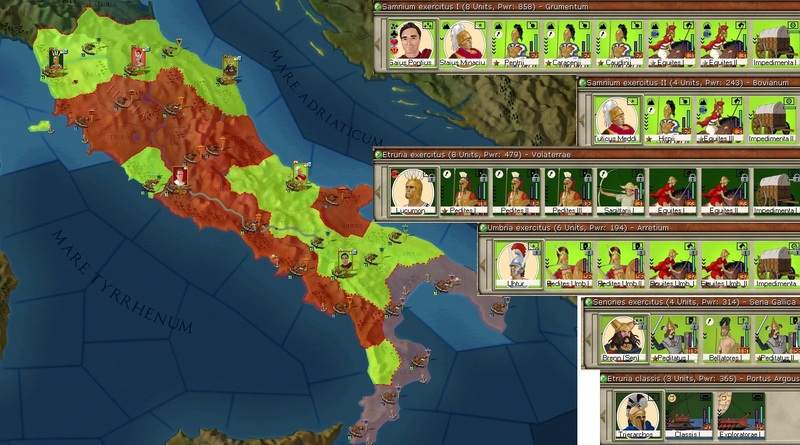 And even more good news, the Etruscan leader is finally activated! Time to launch an all-out counterattack. I want to destroy as many legion elements as possible even if a lot of Etruscans will propably have to die for this cause... but it's not all good news, a Roman legion moved into Bovianum - my most important objective province. I have to counterattack immediately before the garrison surrenders. The Samnite main army will assault Velia and then immediately merge with the smaller one in Luceria. I feel bad leaving Velia undefended after I just wasted so much time taking it but I have no other choice. My navy is low on cohesion and I will move it back to port. The damn Romans retreated before battling the Etruscans, damn it! The Etruscan navy, very low on cohesion, was attacked by the Roman navy but luckily it was still able to destroy one Roman squadron before retreating. I lost one squadron during the retreat, but that doesn't change the fact that I have naval supremacy! The navy retreated into newly taken Velia. I am very short on money so the naval replacements have to wait. Both the Samnites and Etruscans desperately need replacements. Next turn I want to switch to the attack with the Etruscans. There are two completely undefended Roman cities next to the Etruscan capital Volaterrae which would be a nice defensive line making it a bit harder for the Romans to just besiege the Etruscan capitel. So I want to take these two next turn. The Samnites have to drive the Romans out of their capital province. A newly recruited cavalry unit will reinforce the - now single - Samnite army for the attack next turn. After that my actions will depend on the weather conditions - after all will soon be Winter! Well, turns out the Romans redecided they did actually not want to take my capital. So they just moved back into Rome - definitely fine with me. The Etruscan army splits up to take both Populonia and Clusium. The Samnite army which was just merged splits up again as well: the 1-star leader Staius Minacius will move against Hatria, a small Roman allied settlement between Sena Gallica and Bovianum - not allied to Rome on the first turn thus not present on the map. Strategically it would make a lot more sense to take Capua and Spoletium but this would threaten the Romans and allow them to call a Dictator. I need to prevent that at all cost! The Etruscan navy will blockade the port of Neapolis to help with the siege. To hold Velia I am moving a cavalry unit into the province.. not exactly ideal for defense but I can't spare one of the way more powerful Samnite infantry units! And I need a garrison in Valie to gain 2 victory points per turn. On the other hand it means the Samnites have nothing to fear now. Not that it really changes anything: they can't assault Naples because the fort level is too high and the army besieging Hatria is too small to assault it. I hope that I am able to take Naples before the Romans return, a level 2 fort with a port would be perfect to defend. So that was 298 BC. Not a bad year at all! I took Luceria and Velia and didn't lose a single province. 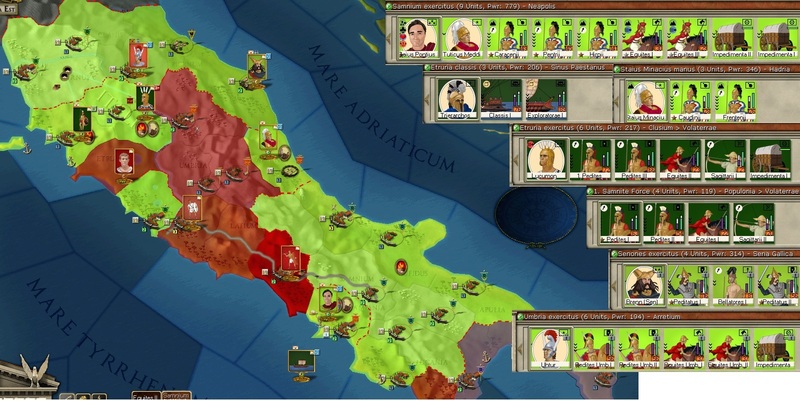 Next year will hopefully see some decisive battles and I will have to decide whether I want to move closer towards Rome and allow them to call a dictator or defend the provinces I already have until the Romans are weakened enough. Next year might also see the entry of the Umbrians into the war. The Etruscans under their Lucumon (I suppose a "Lucumon" is just a generic army leader or something? Since he is the same in every scenario) take Clusium without many losses and retreat towards Volaterrae, the other half of the Etruscan army managed to retreat without an encounter as well. Hatria already surrenders but as I mentioned earlier I can't advance because I don't want the Romans to elect a dictator. I will merge the detachment with the main Samnite army again in case the Romans decide to redeploy their legions to break the siege of Neapolis. I was a few denarii short on paying upkeep and a few elements were affected but I have placed several replacement decisions now to gain more money. No combat occured. The Romans decided to leave the Etruscans alone and instead move against the Samnites. Their (4) legions are in Capua right now and will propably attack my force besieging Neapolis next turn. I set the Samnite army to hold the position at all cost. The Samnite army contains nearly all Samnite units right now and has an impressive strength of 1254 with 30.000 men in total. The leader is very good in defense thanks to his defense rating of 4. So I am confident I can hold them off at least for one turn. The Etruscans, now without any enemies nearby, will take Populonia next turn. Their army, now with an additonal infantry and archer unit compared to the start of the game has 28.000 men but is not even half as strong as the Samnite army: 639 power. Still not too shabby! The Romans want to move their navy out of besieged Naples but the attack against my navy obviously fails, I don't lose a single man. They lost 1/3 of their men (370/1000) but no elements. Populonia falls quickly after a determined Etruscan assault. A Praetor was defending it with a Socii cavalry unit but it didn't help. 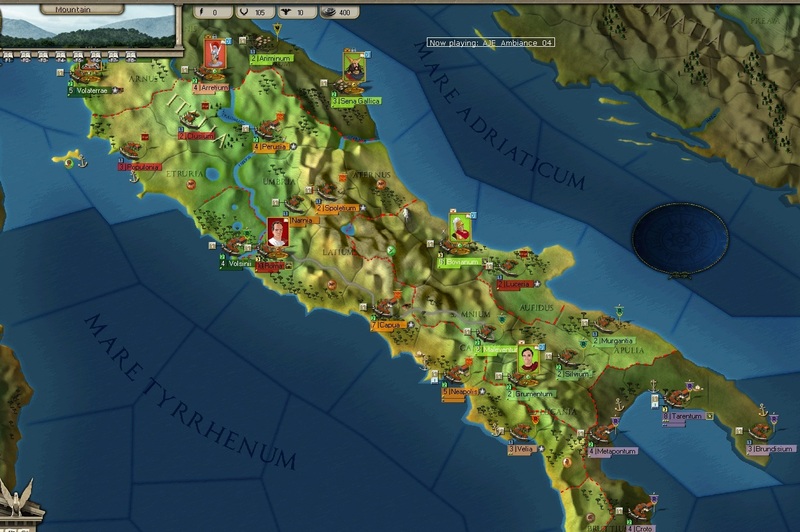 The Etruscans will stay in Populonia for a turn to reinforce. The most glorius news is however the fall of Neapolis! The garrison surrenders without a fight. But even with all the gloriusness let's not forget that there were never any actual decisive battles in this war. The Roman military is still as strong as ever. Speaking of the devil, the Romans have not attacked my forced at Neapolis but instead they moved into Maleventum. I can't attack this huge army composed of four legions and several supporting elements... but I can just ignore them! For now the Samnites will stay in Naples where they are dug in and can retreat into the level-2 coastal fort when attacked. Finally, I have made so many prisoners that I am able to humble them. I have no idea what that actually is (anyone? my English isn't very good) but it gives me 2 National Morale and 20 Victory Points. The Romans took Maleventum. Poor garrison didn't know what his them. Apart from that, nothing significant happened but the Etruscans are growing impatient. A daring plan is made: the army will move into poorly defended Rome and besiege it. The Romans will hardly let Rome be taken this easily but at least they will have to retreat their legions from Samnite territory if they don't want to lost it. Fun fact: the Roman navy is still alive and currently at sea but they don't have any ports left. Let's see how long the poor sailors will hold out at sea. This also makes my navy rather useless. The Etruscans have reached Rome and have started the siege. They received a new general: (a?) Cilnius who replaced the Lucumon as commander. He has identical ratings (3-1-2) but doesn't have the "Weak morale" negative trait of the Lucumon which gives a -5 cohesion penalty. The Romans apparently don't really care for Rome: their army is still camping at Maleventum. Maybe they are resting for the counter-attack? The Samnites don't want to be inactive either and they attack Capua. Eventually, they want to rejoin the Etruscans at Rome. Is this the end of the Roman republic?? The attack on Capua was was very successful, 6000 Romans perished including a Socii cavalry unit. Gaius Pontius is now besieging Capua with his 1337-strength army. This siege is strategically excellent because if the Roman army (which moved to Neapolis to besiege it) now wants to reach Rome they have to either attack the Samnite army or take the long way. If the Romans call a dictator they would propably easily be able to attack the Etruscan army besieging Rome but as of yet there is no sign of the dictator. And that was that! Rome is defeated and the Etruscan warriors are parading through the capital of the humbled Republic. That was certainly easier than anticipated. There was no decisive battle between the Roman legions and the Samnites, in fact the Samnites hardly fought any battles at all. But then again I also got absurdly lucky - Rome surrendering after 3 turns siege! That is an absurdly short time. Tell me what you thought, and I will propably start Agel Gallicus against the AI in the next days. You realize now that when Gibbon writes "The Rise and Fall of the Samnium Empire" and it flops in the book stores, the world shall look to you as the root cause? Thanks for this, there is a strange lack of AARs in this forum, and this helps fill the gap nicely! If anyone would like to do a PBEM with me (1st Punic War? ), with an eye towards posting it as an AAR, let me know; I would be interested in doing this. Thanks! Maybe the dictator appeared and just staid in Rome, I didn't really watch the Rome garrison. I can only give you the save after I have won. I'll just give the scripts folder and the save folder as rar, if that's wrong tell me what to provide instead. jimwinsor2 wrote: Thanks for this, there is a strange lack of AARs in this forum, and this helps fill the gap nicely! I played this scenario recently, and it also ended with the fall of Rome. The Roman AI split its force from the start, so they could be beaten on both sides. The Samnite force was busy fighting and defeating one consular army. The Etruskan army held its ground and defeated the other one in defence. It then persued Roman elements to the West over the river. All the fighting did trigger a dictator, who attacked the Samnite capital. The Samnite army gave all it had and protected its capital, but also suffered a defeat in a follow up attack in open ground. Some Socii Ala originating from Rome attacked North to reconquer land. The Etruskan army did't want to attack them across the river and made a detour over Rome. From there I intended to attack the Ala, aggressively in assault mode, but this meant they assaulted Rome immedeately, and they succeeded, and so ended the war.